The Famous Chocolate Cake is Real! Chocolate, as many of us are conscious of, works wonders with women. Mind you, I’m not discriminating here. I know men can be ‘into chocolate’ as well, but like with high heels & diamonds; some worldly possessions simply find their way more often to a woman than to a man, and chocolate, as I know after half a life time of personal experience in the field, is one of those items. When Tom & I were doing research for Bloodlines – Touch Not The Cat and visited Ballindalloch castle for the first time; it was the chocolate cake I spotted in the castle tearoom that pulled me straight into fantasyland. ‘”I see you’ve discovered our famous chocolate cake” I had our character Angus later say to Cathy the cop, on page 173 of Bloodlines Touch Not the Cat. “I’ll come back next year… just for the cake” Cathy answered; And such was true! When a year later Tom and I drove through the gate of Ballindalloch castle again, I knew one thing for certain: I was going to have another piece of that chocolate cake. Those who have seen the ‘Ice Age’ movies featuring the rodent obsessed with acorns; can picture me with the same behavior towards chocolate cake. If Tom hadn’t stopped me I would have written a whole lot more about Cathy’s taste buds and the effect the Ballindalloch cake had on her hormone levels. I certainly would have had Angus offer the possibility for Cathy to get the recipe. But helas! Pouting my lips and ready to put up a fight I retaliated, I at least wanted to mention the cake in the acknowledgements of Bloodlines Touch Not the Cat. I got my way; for the chocolate cake comment in the acknowledgements is written in Italics as a special request in my name, but that is as far as I got. However… for (wo)men who recognize the need for chocolate cake, I have very good news. Even though Angus was not allowed to give the recipe in our novel, the real Laird of Ballindalloch, wrote a whole book filled with lovely food suggestions. 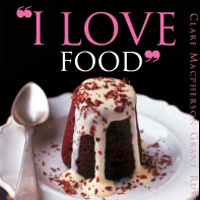 “I love food” by Clare Macpherson-Grant Russell, can be found on the official Ballindaloch website (with a picture of the chocolate cake) and can be bought through all regular (online) booksellers. And again… I can really recommend it!! !